Employment Opportunities - Fresh, Local Breakfast, Brunch and Lunch. Motivated to serve and become a leader? For thirty years, Egg Harbor Café has been developing restaurant leaders who thrive in an atmosphere of optimism and opportunity. A successful, third generation family-owned and operated organization, we invite you to join our ever evolving team. Our proven team-based management, service and culinary systems will support your success in a culture where people care about fellow team members, our customers and our communities. If you get energized reading about the values, rewards and culture of Egg Harbor Café, we want to talk with you! Restaurant closes at 2:00 p.m. Built on a solid foundation of opportunity, empowerment and teamwork, your career path at Egg Harbor Cafe opens to a bright and rewarding future. We offer leadership training, mentoring and resources to fully engage you as you achieve your goals and develop your career. You are energetic and creative, reliable and flexible, a determined team player… and we want to meet with you. If you are available to work weekends and holidays, and eager to be at the best breakfast and lunch place to work for or visit, apply today. 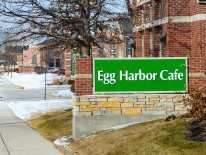 Let’s start talking about a great Egg Harbor Cafe career!